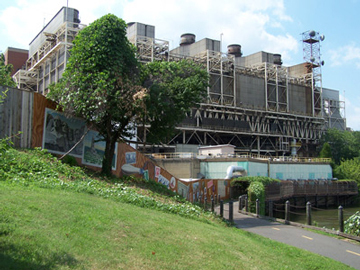 Until it was closed in 2012, the Potomac River Generating Station provided electricity for customers of Potomac Electric Power Company in Washington, D.C. and most of Montgomery and Prince George's counties in Maryland. The plant's first generator began commercial service in October 1949. Its coal-fired generating units had a net summer capacity of 482 megawatts. In 2006, former owners Mirant Corporation agreed to make major improvements to the plant to reduce air pollution. The new owners, NRG Corporation, at first agreed to continue the improvements at the plant, but in late August 2011, decided to close the plant in 2012. The decision was viewed as a victory for environmental groups that had called for a closure of the plant.